As the civil war in Iraq dominates headlines, it is no surprise that the world continued a seven-year-slide away from peacefulness over the last 12 months, as measured by the Institute for Economics and Peace. Syria displaced Afghanistan as the world’s least peaceful nation in its newly-released Global Peace Index, compiled before the latest upsurge in fighting in Iraq. Iceland maintained its status as the most peaceful country, with six other European countries plus Canada, Australian in the top 10. Britain was ranked in 47th place, one above France and one below Lithuania. 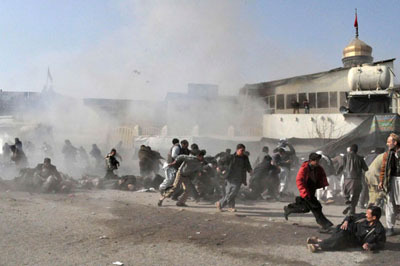 Terrified worshippers run for cover after suicide bombers killed scores of Shia Muslims in Afghanistan in December 2011. That pattern reversed the previous 60-year trend towards increasingly global peacefulness following the end of the Second World War. The economic impact of containing and dealing with the consequences of global violence last year was estimated to be $9.8 trillion (£5.8 trillion), or 11.3 per cent of the world’s gross domestic product. That figure is equivalent to the combined GDPs of Britain, Germany, France and Italy; or twice the size of the economies of the 54 African nations. The bloody civil war in Syria pushed that country to bottom spot, replacing Afghanistan. South Sudan, where civil war threatened to tear apart the world’s newest nation just three years after its birth, experienced the largest drop and now ranks as the third least peaceful country. Iraq was in fourth from bottom place even before the latest outburst of sectarian killing. Major deteriorations also occurred in Egypt, Ukraine and Central African Republic. The United States dropped to 101st place, two slots below Haiti, in data reflecting the impact of the Boston marathon bombings, while Russia remained one of the poorest performers globally, ranking 152nd. Using new statistical modelling techniques, the IEP identified the 10 countries most threatened by increased levels of unrest and violence in the next two years as Zambia, Haiti, Argentina, Chad, Bosnia and Herzegovina, Nepal, Burundi, Georgia, Liberia and Qatar. But Georgia also enjoyed the largest improvement in peace levels as it recovered from its 2011 conflict with Russia. Terrorist activity, the number of conflicts fought, and the number of refugees and displaced persons were the key contributors to the continuing deterioration in global peacefulness last year, according to the IEP. Steve Killelea, the institute’s founder and executive chairman, said: “Many macro factors have driven the deterioration in peace over the last seven years including the continued economic repercussions of the global financial crisis, the reverberations of the Arab Spring, and the continued spread of terrorism. "As these effects are likely to continue into the near future, a strong rebound in peace is unlikely. “This is resulting in very real costs to the world economy. Increases in the global economic impact of violence and its containment are equivalent to 19 per cent of global economic growth from 2012 to 2013. 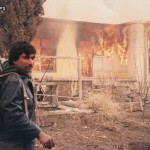 The Committee to Protect Afghan Journalists (CPAJ) on Thursday said it had registered 41 cases of violence against media representatives during the first six months of the year.